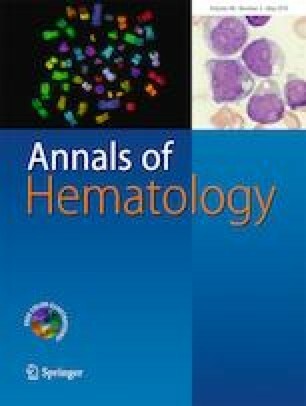 To investigate the effect of chronic graft-versus-host disease (cGVHD) on the outcomes of acute myeloid leukemia (AML) patients who relapsed after allogenic hematopoietic cell transplantation, we performed a retrospective analysis on 218 patients with a median follow-up of 21.4 (3.4–179.6) months. A total of 103 patients developed cGVHD, with a 2-year cumulative incidence of 48.9% (95% CI 42.1–55.7%). The estimated 3-year overall survival was 85.7% (95% CI 75.7–95.7%), 48.8% (95% CI 31.7–66.0%), and 54.1% (95% CI 44.3–63.8%) for patients with limited cGVHD, extensive cGVHD, and without cGVHD (P < 0.001). The 3-year event-free survival were 75.5% (95% CI 63.7–87.4%), 46.0% (95% CI 28.8–63.2%), and 45.0% (95% CI 35.6–54.4%) (P < 0.001), while the 3-year cumulative relapse rates were 22.8% (95% CI 11.0–34.6%), 11.6% (95% CI 5.3–22.6%), and 40.3% (95% CI 31.0–49.6%), respectively (P < 0.001). At the last evaluation, 62 patients relapsed with 17 patients having active cGVHD and 45 without. Compared to patients relapsing without cGVHD, patients who relapsed with cGVHD had a longer duration of remission and a better 2-year post-relapse survival [10.9 months (3.7–42.2) versus 4.4 months (2.2–28.3); P < 0.001]; [32.8% (95% CI 8.2–57.4%) versus 4.5% (95% CI 0–12.8%); P = 0.043]. For patients who relapsed with cGVHD, the remission rates were both 60% after salvage chemotherapy with or without donor lymphocyte infusion (P = 1.000). In conclusion, cGVHD may exert a stronger graft-versus-leukemia effect, which may decrease the post-transplantation relapse rate and may also benefit those patients who eventually relapsed after transplantation in terms of prolong post-relapse survival. Ziwei Wang and Chunrong Yin contributed equally to this work. The online version of this article ( https://doi.org/10.1007/s00277-019-03682-2) contains supplementary material, which is available to authorized users. ZWW collected and verified patient information, analyzed the data, and wrote the manuscript. CRY collected and verified patient information. JMW and JH designed the study, wrote, and modified the manuscript. All other authors involved in treatment of the patients. All authors have read and approved the final version of the manuscript. This study is supported by the National Natural Science Foundation of China (NSFC 81530047, 81270638, 81090413) and Science and Technology Commission of Shanghai Municipality (08JC1406500, 05DZ19327) to JMW.